The solutions I’ve read don’t consider obstructions in the way and forget there are no such thing as plumb and square corners in a house. There are lots of people you don’t know who get in and out of your attic, especially when you’re not home: home inspectors, appraisers, heating & air contractors, electricians, and pest controllers–just to name a few. These folks have to figure out what you’ve done to the scuttle hole so they can put it back when they’re done! 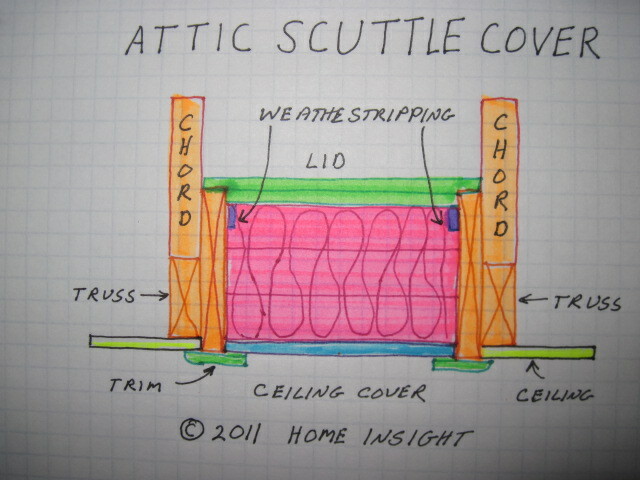 Building this attic scuttle hole cover assumes you’ve read our companion post: 51 Attic Holes: Scuttle Hole. It has the requirements and basic idea, along with other very important information. If you don’t have it, get it. We chose an attic with trusses to illustrate our solution because it’s usually the most obnoxious. Frame. To achieve R-30, we need 6 inches of R-5/inch insulation board. The frame has to be deep enough to hold the insulation, ceiling cover and bottom of the lid. Using 1/2 inch drywall for the ceiling cover and 1/2 inch plywood for the bottom of lid, allow 7 inches! We lined the sides against the trusses with 1x8s cut exactly to 7 inches for the insulation board, lid, and drywall ceiling cover. Trimmed 2x8s are uses for the ends. The frame is put together with deck screws after sealing the edges with silicone. Don’t forget to seal the frame to what ever it’s attached to or mounted on. Lid. The lid is two pieces of wood sheathing. The top piece just fits around the top of the frame with a little wiggle room. The bottom of the lid fits perfectly inside the top of the frame. Screw-on weatherstripping is snugly installed against the lid to form the air seal. The weight and friction of the lid are enough to hold the lid in place when the insulation fits against it. Ceiling Cover. The insulation fits snugly, but not tight in the frame. The edge of the top piece is cut to fit around the weatherstripping. These pieces are put together with adhesive caulk, suitable for foam. Our approach uses 4 screws to hold the trim around the ceiling cover against the ceiling. We prefer to attach the trim to the ceiling cover. When we remove the screws, the ceiling cover comes down with the rigid insulation attached. The light-weight ceiling cover can easily be held with one hand while putting screws back in. The insulation fits snugly between the lid and ceiling cover without lifting the lid off the weather stripping. Our Secret. The hardest design requirement to meet was making sure air didn’t circulate in the gap between the insulation and frame. The primary concern was hot and cold attic air movement. The mental block we had to get over was that the ceiling cover had to be pushed up into the attic. It never occurred to us that it could be dropped down. Now the bulky thing is easily put out of the way! The circulating attic air was solved by using a thin lid we can “throw” around the attic that fits against weatherstripping. Ideally, there should be dead air space in the gap, where nothing circulates. Using a gasket around the trim seals air out from inside too. We also made the insulation board fit snugly against the lid and frame to minimize the gap. Our secret is moving the insulation gap inside the house, where any air circulation is not hot or cold attic air! In addition, we’re not moving some bulky thing around in limited attic space. We carry it down the ladder for scar-free, temporary storage instead. Hint, we use an adjustable height A-frame ladder. A step stool and ladder could be used instead. If there is a gas appliance in the attic, be sure foam is sandwiched between something like plywood/OSB and drywall. The issue is the smoke and flame spread indexes. Foam burns fast and creates a lot of toxic smoke when burned. If there are gas appliances inside the house, be aware that if your house is close to or already considered air tight, any natural draft gas appliances could backdraft. Be sure to get a combustion safety test done if you’re at all close on the air infiltration numbers. Assuming basic tool knowledge and the ability to cut the frame to exact dimensions with a table saw, this is an easy DIY project. The only special tool you’ll need is a thin-kerf plastic table saw blade. Rigid Foam Board. Foamular rigid insulation board is available from ½ – 2 inch 4’x8’ sheets. I found it at a local lumber yard, not at a chain builder supply store. Adhesive Foam Sealant. Any adhesive caulk/sealant for foam will work. This stuff holds foam on walls while still wet. This is available at a chain building supply store. Look on the back of the tube to figure out it if it’s for foam or not. Screw-On Weatherstripping, One name for this is vinyl bulb seal door jamb weatherstrip. Here’s an example. Thin-Kerf Plastic Saw Blade. The goal is cut foam without mangling the edges or melting it. I found a Diablo Thin-Kerf Non-Ferrous Metals/Plastic saw blade at Ace Hardware. I could not find it a Home Depot or Lowes. Look at the link for specifications to determine suitable substitutes. Do you have any innovative solutions or success stories you’d like to share? We’ll try and post ‘em.